Durability – Made from heavy gauge 304 stainless steel, Fire Magic grills resist rust and corrosion for years to come. The Diamond Sear stainless steel cooking grids are non-stick and heavy duty, so they’ll easily withstand many years of use. Versatility – Able to reach both high and low temperatures, Fire Magic has created one of the most versatile grills on the market. Their cooking surface area has been engineered to be larger than competitors at the same grill width. Fire Magic offers five ways to BBQ: grill, sear, smoke, rotisserie, and even charcoal (with an insert). Aesthetics – People take notice when they see a Fire Magic gas grill. Fire Magic grills are considered pieces of art. From LED backlit control knobs to windows that allow you to look into your grill, Fire Magic makes sure your grill is beautiful, but still practical. Fire Magic has proven to be one of the most innovative BBQ grill brands, with various collections to give you plenty of options to find the perfect grill for your needs. Fire Magic Legacy Collection – This collection brings back feelings of nostalgia thanks to the traditional look and feel. 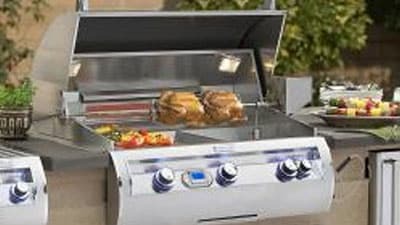 While this grill is available with controls knobs on the front, most of the collection features the older drop-in style with the control knobs on the side, level with the grilling surface. Fire Magic Aurora Collection – While the Aurora may not have the same customizations as the more expensive Echelon Diamond, it does come with many of the same base features. With exclusive E-shaped stainless-steel burners, a removable warming rack, and a spring-assisted hood, the Aurora offers great values at its price point, challenging the idea of what a luxury grill is. Fire Magic Choice Collection –The Choice grills are a bridge between the traditional Legacy collection and more luxurious Aurora collection. The grills in the Choice collection feature updated modern styling, similar to the Aurora collection. Though it does not have as many features as the Aurora collection, it does have more than the Legacy. Echelon Diamond Collection – This top of the line collection combines performance, beauty, and innovation. Don’t be fooled by the sleek design – this collection is packed with awesome features like the hot surface ignition, LED backlit control knobs, and a window to see the food you’re cooking without having to lift the lid, so less heat escapes. It also has a 4-Zone illuminated digital thermometer with a meat probe so you can spend more time socializing and less time grill tending. These added features will bring your grilling to the next level! Echelon Black Diamond Collection – This collection comes with all the same amazing features as the Diamond series, but with a porcelain coated finish and satin stainless steel accents.